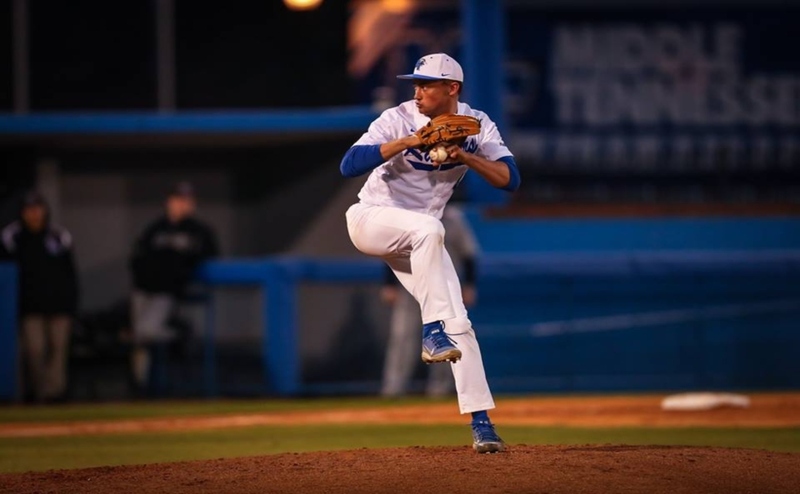 The MTSU Blue Raiders (18-17, 6-8) continued their powerful tear on the UAB Blazers (16-19, 5-9) this weekend, this time scoring 18 runs to claim the 18-3 win Friday in seven innings due to a run-rule at Reese Smith Field. 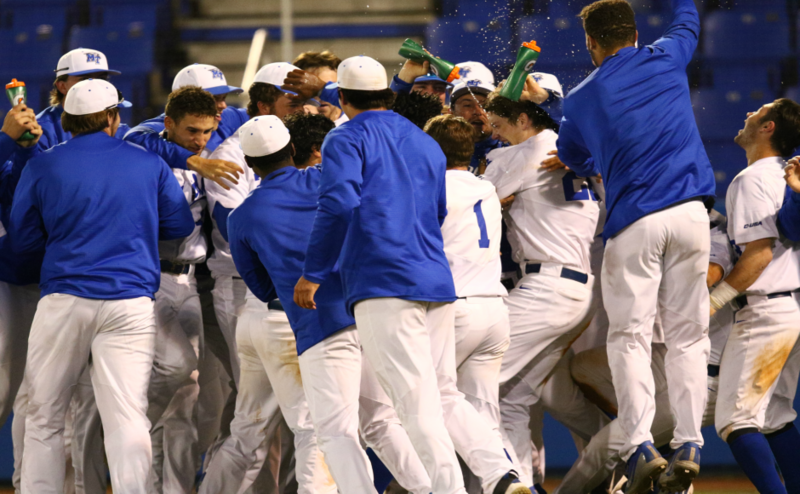 The Raiders claimed the series win, and picked up some ground in the C-USA standings. 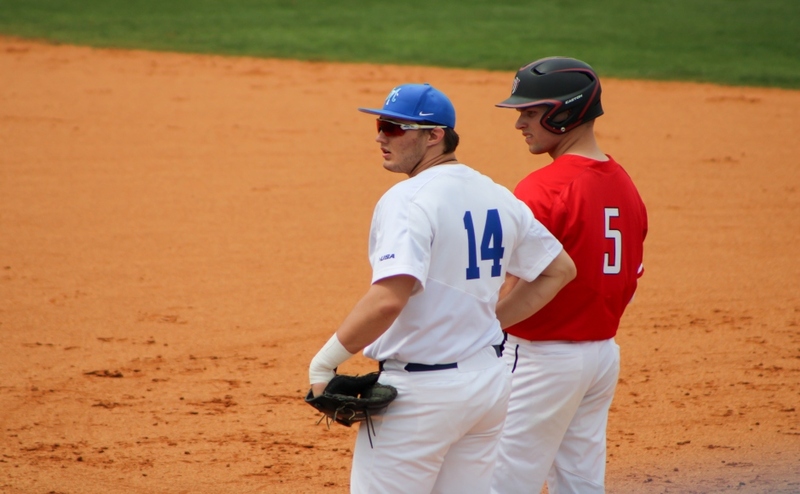 MTSU started the second inning down 1-0 when Austin Dennis hit a leadoff home run. Blake Benefield later doubled to bring in Kaleb King, giving the Raiders their first lead of the night, 2-1. In the bottom of the third, Ryan Kemp and Aaron Aucker hit back-to-back home runs to extend the lead to 4-1. Kemp’s home run was his fourth of the season. Aucker’s home run was his team-leading sixth of the year and his fourth big fly in his last four games. A huge seven-run fourth inning, capitalized off of two UAB throwing errors, helped MT jump out to an 11-3 lead. Dennis continued to help the Raiders blow the game open in the fifth inning when he hit his second career grand slam and collected his fifth RBI of the night to pad the MTSU lead, 15-3. 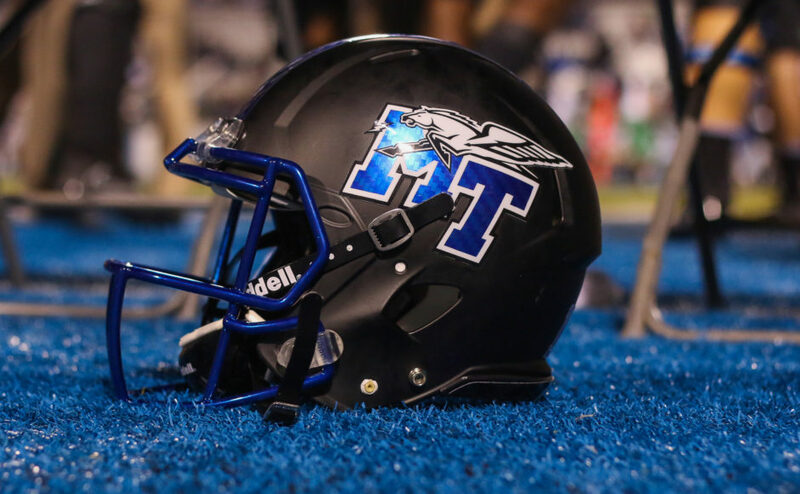 MTSU starter A.J. Spencer had himself another solid night and picked up the win to improve to 2-0 on the year. The right-hander exited the game after 5.2 innings and gave up three runs on seven hits. Spencer also tied his career-high with six strikeouts. Manuel Lopez hit a pinch-hit three-run home run in the bottom of the seventh to end the game due to a run-rule. It was the first home run of Lopez’s career. MTSU came into the fourth inning with a slim 4-3 lead. That all changed when they tacked on seven runs on six hits and took advantage of two Blazer errors to jump out to an 11-3 lead. The Raiders got their first two runs in the fourth inning when Riley Delgado’s sacrifice bunt attempt turned into a hit. UAB pitcher Adam Lamar fielded the bunt attempt and threw it into right field to score Benefield and Vesser. Brad Jarreau then singled in Delgado to give the Raiders their third run of the inning to make the MTSU lead 7-3. Drew Huff delivered with the bases loaded, singling home Aucker for the Raiders fourth run of the inning. On the next at-bat, a pitch hit Benefield to bring in Dennis. Near the end of the inning, UAB catcher Pierce Ressmeyer threw away a snap to third base which sailed into left field, scoring King and Huff for the Raiders’ final runs of the fourth stanza. 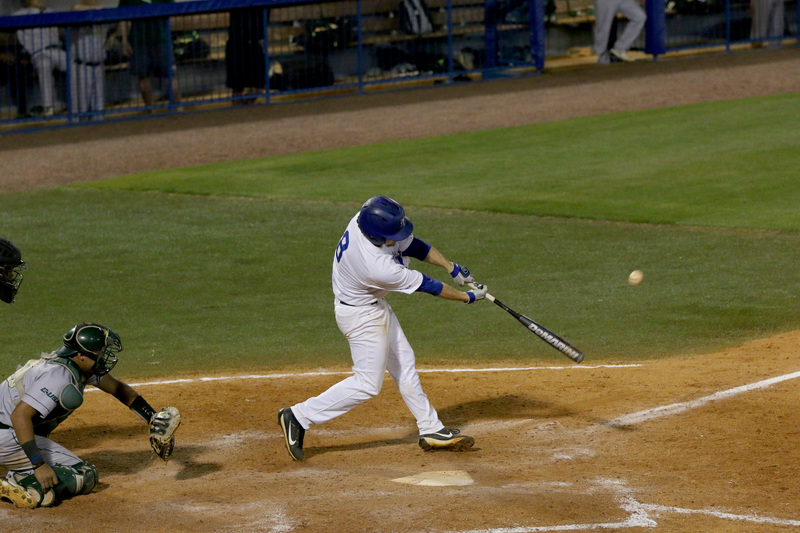 MTSU continued to rely on the long ball. The five home runs they hit tonight matched their home run total from their Sunday game with Old Dominion. In the second inning, Dennis hit the first home run of the night for the Raiders to tie the game at one. Dennis’ home run was similar to the infamous situation that occurred to MLB star Jose Canseco in the late nineties. After Dennis’ hit made it to the left field wall, UAB left fielder Colton Schultz’s leaping attempt to make the catch ended up helping out Dennis, as the ball deflected off of Schultz and went over the wall. In the bottom of the third, Kemp and Aucker’s back-to-back homers padded the Raider lead to three runs. Kemp’s home run just escaped over the left center field sign marking 365 feet. Aucker ripped the 1-0 pitch into the concourse of Floyd Stadium to give MTSU the 4-1 lead. In the bottom of the fifth inning, Dennis hit the second grand slam of his career, and his fifth home run of the season. Jarreau, Kemp and Aucker all got on base to start the inning, providing Dennis with a prime situation to drive in more insurance runs. Dennis jumped on the 2-1 fastball and promptly sent it over the left field wall for his fifth RBI of the game. Lopez hit the final home run of the night. The three-run line shot over the left field wall was Lopez’s first career home run and ended the game early after just seven innings. The Raiders will finish up their home series with the Blazers Saturday afternoon at 2 pm. Tickets are only $2. The team is off Sunday for the Easter holiday. 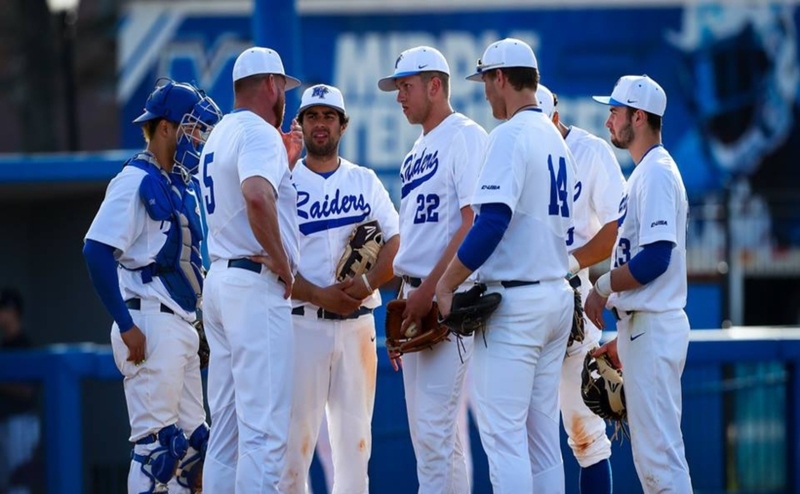 MTSU will resume play on Tuesday night at 6 pm as the Vanderbilt Commodores come to Murfreesboro.